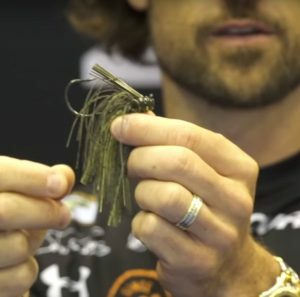 Whenever I’m around a tournament, a sport show or the dock I’m often asked about jigs. The prevailing wisdom seems to be that a jig is a jig. Why should anyone spend their hard earned money on a new one? Well, the answer is because a jig is not a jig. There are good ones and ones that are no so good. 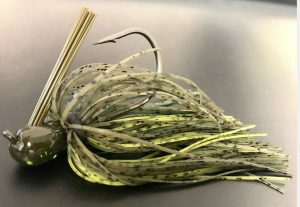 The new Missile Baits Flip Out is one of the good ones and that’s because we — John Crews and myself — took the time to do it right. We tried to do everything right from the very beginning. First, we ordered a prototype. Then we fished with it. Then we sent it back for another prototype. Then we started the process all over again. After it went back and forth a half-dozen times or so we had what we wanted. The idea for this jig came from the success of the Mini Flip. But, as good as that one is, we knew we needed a bigger model for venues with bigger bass and bigger forage. The Flip Out is currently offered in 3/8, 1/2 and 3/4-ounce weights and in six colors. We drilled down on five features for this jig. The first one was the head shape. The most important part of that was a weight forward design. That helps the jig maintain its balance and helps it work in and out of cover without snagging so much. The next thing was the line tie. This is probably the second most underrated feature of a jig. It’s all about angle and position. Our tie is at 60 degrees. That’s perfect. It gives it just the right action to look real. More or less of an angle than that makes the jig act stilted and phony. And, we recessed the tie. That protects the knot and, at the same time, keeps the eye from sticking out where it’ll attract weeds, leaves and other debris. The third issue we had to deal with was the angle of the weedguard. This is the most underrated feature of a jig. If the guard sticks up too high, it’ll keep the hook from snagging but it’ll also keep you from getting a good hookset. If it’s down too low, it’ll be useless. You’ll hang on everything. We also wanted a bigger, stronger hook. We got one from VMC. It has a giant gap that’ll give us solid hooksets no matter the cover we’re fishing or how hard it is to get a good angle on the bass. And it’s strong enough to fight a whale without bending or breaking. Finally, and this one is super neat, we designed a 360 degree trailer keeper. 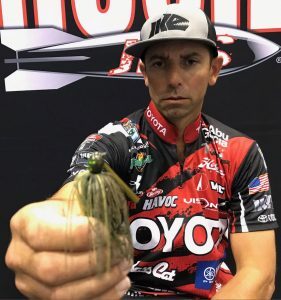 No more single barbs on the shank that pull out and tear your plastic or lost fish because your trailer tore loose and fouled between your hook point and the bass’ mouth. 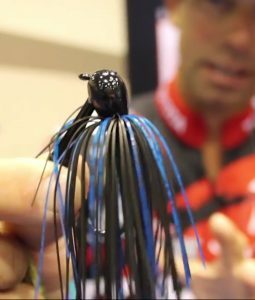 The Flip Out is a serious jig made for serious anglers. Fish it. You’ll agree.